Rancho Mission Viejo is a new community being built in south Orange County starting in 2014. The community is located to the east of San Juan Capistrano and south / south-east of Ladera Ranch. The community of Rancho Mission Viejo is the largest housing development ever planned for south Orange County. It eventually will have 14,000 homes developed in multiple villages over the next two decades, with talk that it could become Orange County's 35th city. The first phase(village) in the community is named Sendero – the Spanish word for path – a development of about 940 homes and 200 apartments where Ortega Highway meets Antonio Parkway. The second phase(village) is named Esencia. This village will feature 42 unique models and a variety of attached and detached homes in distinctive neighborhoods. That includes four Gavilán neighborhoods with single-level living for the 55+ crowd. All models for the 2nd phase are currently open. 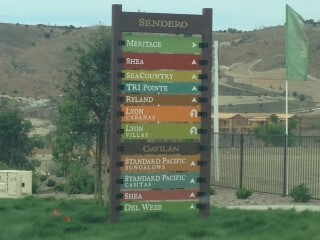 Sendero is the first phase of the Rancho Mission Viejo new home community. The construction of Sendero has already been completed. There are however re-sale homes available in Sendero. Esencia is the second phase of the Rancho Mission Viejo new home community. The home models for Esencia are all open and available for previewing. For more information on Rancho Mission Viejo homes for sale please contact Scott Bingham today at 949-412-3515.